The aim of this study was to determine if there was a long-term increase in glycopeptide minimum inhibitory concentration (MIC) values, MIC creep, among bloodstream isolates of Staphylococcus epidermidis and S. haemolyticus isolated from patients with hematological malignancies. 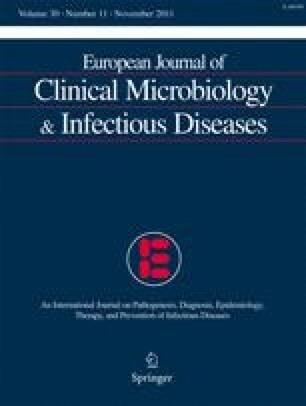 We conducted a retrospective single-center study where all positive blood cultures of S. epidermidis (n = 387) and S. haemolyticus (n = 19) isolated from patients with hematological malignancies during three decades, 1980 to 2009, were re-evaluated for the presence of reduced susceptibility to vancomycin and teicoplanin. Three different methods for the detection of reduced susceptibility to glycopeptides were used; standard Etest, macromethod Etest, and glycopeptide resistance detection (GRD) Etest. The median MIC value for vancomycin was 2 mg/L. MIC values for vancomycin and teicoplanin did not show any statistically significant increase during the study period. The presence of heterogeneously glycopeptide-intermediate staphylococci (hGIS) was analyzed among 405 coagulase-negative staphylococci (CoNS) isolates. hGIS were found in 31–45% of the CoNS isolates by the macromethod Etest and in 53–67% by the GRD Etest during the three decades. In conclusion, we did not observe any long-term glycopeptide MIC creep determined by the standard Etest, although a high and increasing proportion of heterogeneous vancomycin resistance was observed. The study was supported by grants from the research committee of Örebro County Council, Sweden. B. Söderquist has been a consultant for Pfizer and Janssen-Cilag. Research Committee of Örebro County Council, Sweden.